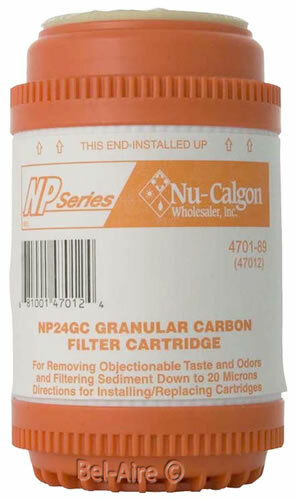 The NP24GC is an activated carbon cartridge that are ideal for removing objectionable tastes and odors as well as chlorine. Utilizes NSF-certified granular activated carbon. Removes compounds such as chlorine and hydrogen sulfide that cause bad tastes and odors. In addition, chlorine can be corrosive. The NP24GC is designed to handle up to 100 gallons of water per day for six months. Made with FDA-approved materials. Model NP24GC, Part Number 4701-89.